“Tuck stop scratching buddy you’re going to hurt yourself”. If I had a dollar for every time I said that over the course of 5 years I would be able to cover another four rounds of every treatment option we tried to keep Tucker (my red nose pit bull with severe skin allergies) from scratching himself to death. Tuck is now a 7-year-old pit that I rescued when he was just 4 months old. He never had severe skin allergies until he was 2 years old but when they came….boy did they hit hard. Over the course of the next 5 years I went on to try anything and everything to help ease Tucker’s seasonal skin allergies. I knew his were seasonal as they would begin around May and then leave around October. In this article I want to cover some of the allergy treatments I tried with Tuck and the research that I completed in the process regarding different options. Disclaimer alert, I am not a vet and I do recommend consulting with a vet to determine the best allergy treatment path for your furry friend. There are three different types of allergies we will cover which are atopy, contact, and food allergies. Atopy is caused by environmental or an irritant such as seasonal allergies, mold or flea bites. Contact allergies are something that the dog must come in contact with and then has a reaction such as grass and cotton. Finally there are food allergies, which are pretty self-explanatory. With atopy allergies having the dog not come into contact with the cause is ideal, however not always practical. In my case for example Tucker is highly allergic to certain grasses and pollens, but not letting him ever go outside wasn’t practical. A good option when dealing with outdoor allergies can be things such as wiping off your dog after every outing with baby wipes. You can purchase a lightweight cover that acts as a barrier between the dog and the outside world as well as dog booties to protect their feet. A holistic option is feeding your dog local bee honey or pollen. This must be done with local honey or pollen FROM YOUR COUNTY. The reasoning behind this is that the bees use the local flowers and environmental plants to pollinate and it is then transported to the hive and turned into honey. By feeding it to your dog (I always started with a little drizzle and worked my way up to around a spoonful, however always consult your vet if you are concerned about dosing) you are allowing your dog’s body to build up a natural immunity slowly by introducing the allergens into their system in small manageable amounts. The same premise applies to bee pollen, however this is much stronger so I would highly recommend starting with honey. With outdoor allergies a few more options would be to clear a spot in your yard (if possible) and either plant only grass if they are not allergic to grass or to keep it dirt. This would allow your dog to have a separate area within your yard for him to go to the bathroom and play. Also, keeping your grass cut short and keeping your dog inside during high pollen seasons as much as possible are both helpful in the maintenance of allergies. With any inside allergies such as dust, dust mites, and molds avoidance is the best option. Things such as plastic covering over pet beds, washing bedding in hot water, avoiding stuffed furniture and toys, running AC in hot months, avoiding dusty dog food and toys, using/cleaning/disinfecting humidifiers, and avoiding a large number of houseplants are all helpful solutions. When it comes to topical therapy there are some amazing shampoos on the market. I personally used Jax N Daisy, however ensuring you’re using one with a hypoallergenic or colloidal oatmeal component is key. Hydrocortisone shampoos can also be an option. Once to twice a week is a recommended bathing amount unless your dog is severe then you might want to try every other day for a week or two and then back off. It is important to make sure you do not over wash your dog as you can cause him/her to have dry skin, which then in turn can cause them to itch (it’s a never ending battle I swear). Once again, always check with your vet as he/she knows your dog best and may have a specific shampoo they recommend. Hydrocortisone sprays, creams and powders are also available many times through your vet. These creams can be helpful but you must ensure if you are buying an over the counter cream that it is safe for you to not only apply topically (and in a certain frequency), but in the case that your dog licks the cream off. There are different options you can give to your dog either in their food or if they will just take it by hand, that can help with skin irritation and allergies. Coconut oil as well as olive oil has both been shown to help ease irritated skin. Coconut oil also helps to calm the inflammation system when ingested. If this is something you are thinking of trying, I would choose one oil to start with and if it doesn’t work try the other, though keep in mind anything you start (with any treatment) can take a few months to start seeing any changes. Fatty acids are a fantastic option for allergies. There are many kinds of fatty acids so it is important to do your research on which one and why you are going to start using. This treatment however is a safe and scientifically supported option for assisting with dog and cat allergies. Ingestible non-steroidal medications potentially have their place in the treatment plan as well. These can include options such as biotin, antihistamines, aspirin, and apoquel. Biotin is a B vitamin that has been shown to offer some relief, especially when combined with fatty acids, for dogs with dry skin, seborrhea, and allergies. Antihistamines can be given (in very specific amounts, please educate yourself on dosing sizes and frequencies for dogs prior to administration) to your dog as a way to control allergies. These drugs can have side effects so ensure you’re well versed prior to use. Aspirin is used for pain and inflammation from arthritis and injuries, however it can also help to ease discomfort from severe itching. The dosing amount, types (buffered, time released, etc), and frequencies should be researched and discussed with a vet prior to administration. Please note this is NOT a safe option for cats as it is toxic to them. Apoquel is a non-steroidal medication that has been shown to offer great relief to many dogs. This is one that must be purchased through your veterinarian and it is important to keep in mind that it can be a more expensive treatment option, so you might want to look into others first. Now we are entering the injection portion of today’s read. There are two types of injection options (steroid injections not being counted here) that I tried with Tuck. The first one being a new medication on the market called Cytopoint. This essentially was an injectable version of apoquel, though it worked for Tuck for three months after apoquel had stopped working. This is also one that must be done through your vet. Be sure to ask prior to scheduling if your vet offers it as not every clinic does. Next is immunotherapy (hyposensitization). This is where your dog is tested to see exactly what he/she is allergic to and then a serum is developed to slowly administer a small amount of the top allergens to her/him to allow his/her body to build up immunity over time. There are two ways to test this, through dermal (skin) testing and through blood. I first tried the blood testing with Tuck and after $700, over a year of daily injections, and the extended dosing schedule I was finally told the blood testing was not nearly as effective as the dermal testing (so lovely right?). Most recently I took Tuck up to the University of Florida where he had the dermal testing done. Through this as well as the blood testing the serum can be administered via injection or trans mucosal (a liquid squirted in his gums via syringe). Since Tuck had such a severe reaction to the injections, we opted for the mucosal administration option. FINGERS CROSSED his skin looks amazing and we have had zero set backs with this option. Though it is one of the more costly and time consuming options I can not stress enough the importance of this testing and treatment for your extreme allergy cases. Tuck being so severe and predictable, the University of Florida actually collected samples for a study they are doing on seasonal allergies in dogs. Steroids are a rather controversial treatment option. Though they have their negative side effects, and you most certainly do not want to leave your dog on them long term due to these side effects, they can be extremely helpful in getting symptoms under control and manageable while you find an alternative treatment option(s). Steroids can be administered either orally, topically, or injectable. For some dogs (Tuck included) a course of steroids with a round of anti-biotic are needed to get ahead of everything due to the severe itching which then causes lesions in the skin which can then get infected and exacerbate the situation. With that being said, as mentioned above it is important to search for alternative treatment options due to the long-term ramifications of leaving a dog on steroids. These must be given by your vet, however be sure to have a conversation about the side-effects, the length your dog will be on them, and the game plan for what you’re going to be starting either prior to or as soon as they finish their course of treatment. The next type of allergy we will discuss (I know you’re probably thinking how could there possibly be more?!) is food allergies. Food allergies are more common than a lot of people think and many times can be things we see in our dogs food everyday such as chicken, grains and potatoes. The most important thing to remember when trying to either rule out a food allergy or help it is that the dog must be on the one type of food that you are trialing for at least 2-3 months. This means NO other treats, table scraps, cookies etc. You want to isolate and eliminate the potential cause or see if the new food you’re trying is actually working. I personally always recommend dogfoodadvisory.com for any dog food select assistance (allergy or non-allergy related). This site gives a great breakdown of the food’s rating as well as ingredients and any recalls. Last but not least are contact allergies. These allergies are simply that things the dog comes in contact with such as cotton, grass (which was discussed above), carpet etc. Once again the best option is avoidance. I know….super helpful and insightful. Phhhhfff we are done!!! I know that was a lot of information and I hope you found at least some of it useful. I know I spoke about Tuck and all the things that didn’t work for him, however I want everyone to understand he is SEVERLY allergic to life and the outlier of the allergy spectrum. Many of the options discussed above have helped hundreds and thousands of dogs across the country suffering from allergies. It is also important to keep in mind that many of the dogs helped by the options above are combining some of these treatments such as whipping off the skin after being outside, fatty acids, and antihistamines so be option to combinations. It is important to do your research and trials to determine the best fit for your furry family member. Always be sure to give whatever you’re trying enough time to work (several weeks to a few months at the bare minimum depending on what you are trying). Last but not least please do not forget to consult with your primary vet and potentially even a vet dermatologist (I highly recommend Dr. Boyd at the University of Florida). Thank you for reading and I hope your furry friend finds some relief in some of the options above. Realizing your pet is lost is a very scary thing, but the more prepared you are for this scenario, the better chance you have of being reunited with your furry loved one. Your dog or cat cannot tell the people who find him where he lives or who his parents are. One of the most important things you can do is equip your pet with proper identification. A tag on your dog’s collar with your name, address, and telephone number can help anyone who finds your pet know exactly where he lives and who to contact. Make sure this information is always current and up to date – there is nothing more frustrating for the people trying to help your dog or cat get home than reaching a disconnected number. They know your baby has a family out there, but have no idea how to find you. If your dog or cat does not wear a collar full time, or frequently slips out of their collar, a micro-chip is an excellent alternative! Micro-chips can be implanted and registered to you for a very low cost at almost any veterinarian’s office. Also, take advantage of county licenses. If animal control is called and they check the information on your dog’s license, they will know exactly where he or she lives and attempt to bring the dog home rather than to the shelter. In Osceola County, any pet wearing a current Osceola County pet license gets a free ride home if they are picked up by animal services! If you realize your pet is missing, where do you start? Make sure to file a lost pet report at your county’s animal services. Many people who find pets turn them in to the local shelter, or check there to see if anyone has reported the pet missing. If you live bordering more than one county, it is safest to file reports in both counties since you cannot be certain which county your pet may have been found and turned in. It is also important to visit your local shelter in person to look for your pet. Many shelters receive dozens of pets every day, and it is hard for them to know which of the five tan lab mixes they received this week could be yours. You are your pet’s best chance at being identified and getting home. Putting up flyers in your neighborhood and online through websites like Craigslist and Facebook can also help spread the word that you are looking for your lost pet, make sure to include several good photos from different angles as well as information like the area your pet was last seen – all of this information can help people better narrow down whether the dog they found could be your pet. If you have found a pet, what should you do? Contact animal services to report that pet found. Even if you are willing to hold onto the pet until the owners are located and do not need animal services to pick the animal up, it is still important to file a found pet report as animal services is generally the first place owners may check when looking for their lost pet. If you found a lost dog, try going for a walk to see if anyone is out looking for them or if they seem to lead you to a specific house. Posting flyers in the neighborhood and online can also help locate owners who might be missing their pet. Don’t forget to have all found animals scanned for a micro-chip if they are not wearing identification! Any veterinarian or animal services will scan for a chip free of charge and help you locate the owners of a found pet. If you are unable to hold onto the animal you have found, please turn it in to animal services! Pets left to wander the streets can end up hit by a car, attacked by other animals, or lost for a much longer period of time while owners look for their loved pet. No one wants to be in the dreaded situation of realizing their pet is lost, but the more steps we take to be prepared as pet owners – the better chances our pets have of making it back home safely. Now that you have determined you are truly ready for the commitment of owning a dog, it is time to consider which dog is right for your family. One of the first things you need to consider is whether you want a puppy or an adult dog. Many of the dogs we see surrendered to the local shelters are between six months and two years old. The reason for this is, so many people adopt puppies and find themselves overwhelmed when they develop adolescent behavioral issues. It is extremely important to consider whether a puppy is really the right pet for your household, or whether you would be a better match with an adult dog. The number one thing to consider when determining whether or not you should get a puppy, is how much time you have to devote to your new dog. Puppies need housebreaking, and in order to accomplish this successfully they need to go out very frequently. If everyone is away from the home for long hours every day at work and school, you do not have the time to properly train a puppy. Adopting a puppy if you are gone long hours is setting you up to feel overwhelmed and frustrated as the dog continues to have accidents while you are gone and lacks the consistency to learn to use the bathroom outside. In addition to housebreaking, puppies require training in order to become well-mannered members of the family. This includes leash training, basic commands, and generally following the house rules such as staying out of the garbage or off of the furniture. If you have never raised a puppy before, there is a lot to learn. If you are not committed to doing a lot of reading on raising puppies, and potentially work with a trainer or enroll your puppy in obedience classes, you may find yourself overwhelmed with the behaviors your puppy develops without proper training and structure. Even with training, housebreaking takes time, and puppies go through destructive phases and chewing and teething – much like a child. If you are not extremely patient and committed to getting past these different phases and working on the behavior, you may find yourself seriously overwhelmed and regretting your decision to adopt a puppy. Puppies are a blank canvas both for training and manners, and for social skills. This means as an adopter you are responsible for providing your puppy with proper socialization. Ideally, your puppy should be getting out into new environments, around new people and new dogs two to three times a week until they are around 18 months old. During these outings, you should be consistently working on good social manners. Just like raising a human child, every social interaction or public outing presents learning opportunities for your puppy on what is and is not polite social behavior. Failure to be consistent on providing adequate socialization opportunities and consistent structure during these outings can result in a dog that is poorly mannered and even potentially develops aggression issues towards new people or animals. Common misconceptions about puppies versus adult dogs are one of the biggest reasons I hear for people who really should not be adopting a puppy justifying choosing to do so anyway. So often I hear people worry over their children or other pets, and proclaim that adopting an adult dog isn’t safe and puppies are the safer choice for their pets and children. This is an incredibly inaccurate statement! Puppies are generally MORE difficult to own with children. They jump, mouth, scratch, knock down, steal snacks, and chew toys and shoes left on the floor by small children. Puppies start out with NO manners, they grow quickly and before you know it their “cute” behaviors of grabbing your small child by the pants leg or jumping to try to take their snack are no longer cute at all and border on dangerous. It is a myth that just growing up with children will make a puppy love children, without both excellent training for the dog and education of the children on how to approach and treat the dog, even a dog raised with children can have issues with the children in your home. While it is true that an unexperienced dog owner should not feel safe adopting a random adult dog with no background information and just letting it loose in their home with their pets and children, there are many ways to safely adopt an adult dog. Find a dog with a reputable rescue organization that has background information on the dog you are adopting; a dog that has lived in a foster home with children, other dogs, cats, etc. Arrange a meeting with your children and/or pets and the potential new family member. Take introductions slow and supervise your new dog with your children and pets. An adult dog that has already received training such as basic obedience training, housebreaking, and house manners can be a much less stressful experience for a busy or inexperienced family. If you are older or have limited physical mobility, you may even want to consider a senior dog whose energy levels and exercise needs are much lower.
. Once you have determined that you are ready to add a dog to your home, and decided whether or not you want a puppy or an adult dog; it is time to consider what breed/type of dog that you would like to add to your family. This is a very important decision, as the breed of a dog is not all about appearance; the diverse looks of specific breeds also come with diverse traits, energy levels, and specific needs. To make this decision you will need to do breed research – read articles and books on the breed(s) you are considering adding to your home, paying particular attention to the temperament and training needs. Consider the jobs these dogs were bred to do and the temperament traits these animals have. One of the first things to consider when choosing a breed of dog to add to your family is the energy level of that breed. Getting a dog that matches your family’s energy and activity levels is one of the most important things to consider. You may have grown up thinking Siberian Husky’s are the most beautiful dogs in the world, but if you work all day and like to come home and watch TV; you will find yourself overwhelmed with the energy level of a dog bred to pull sleds for 8-12 hours a day. Likewise, if you are looking for a running partner you would not be happy with an English Bulldog that tires easily and cannot tolerate heat well. It is extremely important to be realistic and honest with yourself and choose a breed whose energy level matches yours, even if it means re-evaluating that dream breed you’ve always wanted. Dogs whose exercise needs are not being met typically develop unwanted behaviors that range from anxiety or destructive behavior to aggression issues. Another important thing to consider when choosing a breed of dog for your family is any specific traits for the breed that might not mesh well with your home or lifestyle. If you have small children, you may want to be cautious when choosing a herding breed. If you don’t have a lot of training experience you may want to be careful before choosing to add a powerful breed like a Cane Corso or Presa Canario to your home. If it is very important to you that your dog be able to be trusted off leash a hound breed who follows their nose and wanders may not be the best choice for you either. Every breed was bred for a purpose, and many of these breeds still have specific traits and behaviors related to their intended purpose that need to be considered when deciding what breed is going to fit the best in your family. The final thing to consider when choosing a breed of dog is the level of care some breeds require. Some breeds of dogs require significant grooming maintenance that can be costly and time consuming. If you are not committed to regular visits to the groomer, and regular brushing and trimming, you may not want to get a breed with a lot of grooming needs. Additionally, some breeds are prone to certain health issues and allergies that may require special diets, medication and additional veterinary care. If you are not prepared to make monthly vet trips and pay for expensive medications and special diets, you may want to consider a breed that is not prone to many special medical conditions. Remember that just because the dog you are adopting does not have any health issues now, does not mean that you will not see issues develop throughout the dog’s lifetime. Mixed breed dogs are wonderful and make excellent pets and in many cases can have better health and a good balance of different breed traits. However, mixed breed dogs can still carry some of the same needs and issues as pure bred dogs. It is still important to consider the energy level of the dog you are considering, and inquire about any health, diet and grooming needs the dog may have. Choosing a dog that fits your family and their energy level, lifestyle, and expectations can go a long way in setting you up for success as new pet parents! Once you have taken breed traits and temperament, energy level, and health and grooming needs into consideration and have decided on criteria for what age, size, and breed or mix of dog you are looking for – it is time to navigate the adoption process, and transition your new rescue dog into your home. Check out part 3 of this blog series for helpful information on navigating the adoption and transition process. Before you start looking for a the right rescue dog, you must first ask yourself some questions to learn more about whether or not you are ready for the commitment of adopting a dog and what type of dog might make the best fit for your family. If there are other household members who will be responsible for the care and compromise required to add a pet to the home, everyone should sit down and discuss these issues together as a family before moving forward. DOES MY SCHEDULE AND LIFESTYLE ALLOW FOR THE COMMITMENT OF A DOG? If you have never had the commitment of being fully responsible for a dog with your current lifestyle and work schedule, this can be one of the most important things to consider before adoption. Your work and social schedule can be a huge factor in deciding whether or not to add a dog to your household, and what type of dog to get. If you work long hours and do not have another responsible adult in the home that is home during your work hours and able to assist with letting the dog our and providing the dog with play time and exercise, you might have to be prepared to consider options like doggie daycare or hiring a pet sitter during your work days. Your social schedule also plays a big factor in your decision to adopt. If you don’t have someone to share in the care responsibilities for the dog you would need to be able to commit to going straight home after work each evening to let the dog out and provide care. If you frequently go straight from work to happy hour or other social activities with friends, this is a big factor to consider when it comes to adoption. Do you have a friend or family member nearby who could let your dog out and provide care on evenings you are not coming directly home? Are you able and willing to hire a pet sitter to be available to provide care and let your dog out on those evenings? Travel is also a major thing to consider when making the decision to adopt a dog. If you travel frequently, whether for work or for leisure, you need to consider the impact that adopting a dog would have on your travel plans. Would you be able to take the dog along when you travel? It is important to consider the cost of traveling with your pet, and whether or not your schedule when traveling would permit you to bring a dog along. Who would watch your dog when you are out of town? Do you have a friend or family member willing to help for free? Would you be able to afford the cost of hiring a pet sitter or paid boarding while you travel? It is important to give all of these schedule related issues some serious thought. If you have never had a dog as an adult and tried to juggle the care of a dog with your adult lifestyle it might be a good idea to consider volunteering as a temporary foster home for a dog in need with a local rescue or shelter. This could provide you with a trial experience of what sacrifices and schedule adjustments you would need to make to accommodate your new dog’s needs. WILL MY ENERGY AND ACTIVITY LEVEL BE ABLE TO ACCOMMODATE THE EXERCISE NEEDS OF MY NEW DOG? What many dog owners and adopters fail to realize is that most dogs will not exercise themselves just because you put them outside. Most commonly the dogs will sniff around for a brief time, handle their potty business, and be barking at the back door to come back in and be with their family. Providing exercise your dog requires active participation on your part. Whether you choose to take your dog on long walks, or play fetch in the fenced yard, you still need to be prepared to dedicating a minimum of thirty minutes twice a day (see Energy Level in the Choosing a Dog section for more information, some dogs require much less activity and some much, much more) to providing your dog with structured, deliberate exercise. Exercise not only provides health benefits for your dog, it is also vitally important to their mental well-being. A dog that is not receiving enough exercise can develop a wide variety of behavioral issues from anxiety and destructive behaviors to pent up energy that leads to aggressive behaviors. If you are not physically able to participate in providing your dog with the amount of exercise needed you could consider options like putting your dog in doggie daycare, hiring a dog walker, or adopting a senior dog with significantly lower energy and exercise needs. DO YOU HAVE KIDS IN YOUR HOUSEHOLD? If you have children at home, there are some extra things to consider before deciding to adopt a dog. Your children’s ages can be the biggest factor in this decision. If your children are not old enough to understand how to respect a dog’s space and pick up on cues that a dog is stressed or uncomfortable, you will need to be prepared to separate and supervise until your children are old enough to be trustworthy. Depending on your children’s ages, that could be a long-term commitment. The reality is, even the friendliest dogs have limits and can bite if they are cornered or being hurt by a small child and the child is not picking up on the signals that they are uncomfortable. This means you will need to be supervising when the dog and child(ren) are together and separating when you are unable to supervise. If your children are old enough to understand and respect the dog in the household, the next thing to consider is whether or not they have spent enough time around dogs to be comfortable with them and understand their body language. If your children have not had a lot of experience with dogs, you may want to consider offering to house sit for a friend or family member’s dog while they travel, or offer to foster for a local rescue or shelter. This will give you an opportunity to teach your child about dogs and make sure your entire family is comfortable and ready for the big decision to permanently adopt a dog. DO YOU ALREADY HAVE DOGS IN YOUR HOUSEHOLD? If you already have a dog or more than one dog at home and are considering adopting another, your current dog(s) also play a factor in your decision. The number one thing to consider when adding a new dog to your family is whether or not your current dog(s) are well socialized around other dogs. Even if you have more than one dog in your home already, if they have not had regular social interactions with other dogs outside of those in their own home, you cannot be sure how they will react to a new dog joining the family. This is even more of a concern if you have an only dog that has not been regularly socialized around other dogs. If your dog(s) have had limited contact with new dogs, the first and most important thing would be to introduce them to some new dogs and see how they respond (if you do not have experience introducing your dog to new dogs, please do some research on introductions before beginning this step). This can be done by asking a friend, family member or neighbor to assist with their dog. Important Tip: Make sure the dog you are planning to introduce your dog(s) to has been well socialized around other dogs and is friendly. Once you are sure your dog has been well-socialized around other dogs and is ready to have a new dog in the family, it is important to consider your dog when deciding on what dog to adopt. Your dog’s age, size, personality, energy level and other factors need to be taken into consideration before choosing a new dog as a companion to other dogs in your home. For example, if you have a senior small breed dog – a friendly, hyper, large breed puppy would likely be stressful and even potentially unsafe for your fragile senior. Note: If your current dog is struggling with making new dog friends, consider signing up for group training classes or private sessions with a professional to help your current dog gain better social skills before trying to add a new dog into your home. DO YOU HAVE CATS OR OTHER SMALL PETS IN YOUR HOME? It is extremely important to consider the safety of cats and other small animals in your home. If you already have cats in your home, there are some important things to consider. Have your cats ever lived with a dog before? Even if the dog you adopt has lived with cats before and is considered cat-friendly by the shelter or rescue that has him up for adoption, that does not mean your cats will automatically be on the same page. If your cats have never been around dogs before, adding a dog to the family can be a stressful and difficult time for them. It is important to consider that in your decision to adopt, and come up with a plan for slow and proper introductions and ways to facilitate giving the cats down-time from their new dog friends to decompress. If you have other small animals in the home such as ferrets, bunnies, hamsters, birds, etc. it is important to consider their safety when deciding to adopt as well. Ideally you should be prepared to make sure their cages can be safely separated behind a closed door from your new dog, especially when you are not able to supervise. DOES ANY ONE IN YOUR HOME HAVE ALLERGIES TO DOGS? This may sound like a no-brainer, but you would be amazed at the number of people who adopt and find themselves having to return or rehome their new dog due to allergies. If you or any member of your household, especially your children, have never lived with dogs before, it is very important to rule out potential allergies before committing to adopt. An excellent way to do this is simply to have everyone in the family interact with a variety of dogs and see if they notice any concerning symptoms like a rash, itchy, watery eyes or a runny nose or sneezing. The reason it is important to interact with a variety of dogs, is that some dogs can produce less dander than others. Your son may do fine with grandma’s poodle, but then have a reaction to the Labrador you adopt from the shelter. Make sure everyone in the family interacts with any potential dog you are considering adopting including petting and having skin to skin contact, to help check for signs of allergic reaction before adopting. ARE YOU PREPARED FOR THE 15+ YEAR COMMITMENT? Remember, adoption is forever. Many dogs can live upwards of 10 to 15 years of age, which is a very lengthy commitment. It is important to consider not only where you are in your life right now, but what your life may look like for the next 10 to 15 years. If you do not have kids, are you hoping to have them in the next ten years? Are you considering any career changes that might change your schedule or cause you to need to travel more? Do you own your home? If you rent, are you committed to the extra cost and challenges faced when trying to find a rental that will allow your dog? Put sincere thought into your life and lifestyle and what you would do if any major life changes arose in the future. It is a serious commitment and responsibility and should be treated as a major decision that should not be taken lightly. If you have discussed all of these issues in detail as a family and are ready to move forward with adoption, it is time to move on to the next segments of this blog for more information on how to choose the right dog for your household. WHY is a Facility Necessary? Most of our supporters are already well aware of our current campaign to raise the necessary funds for our first ever facility. However, we realize that many may not fully understand why this facility is so important to Central Florida. First, this facility will save lives – which is obviously the primary objective. Yes, we already save lives using the foster based rescue model that we – and many other local area rescues – have been using for years. The foster model relies on local families opening their homes to foster dogs in need – but, these families aren’t experienced in training or dog rehabilitation. This means that the dogs we are able to save in foster homes, are generally already highly adoptable. Unfortunately, the majority of dogs euthanized in Central Florida have negative temperament notes and are in need of behavioral rehabilitation. In order to save these dogs – who need it the most – we need a safe place to house, train and rehabilitate them. This facility would be the first of it’s kind in Central Florida, the only rehabilitation center for shelter dogs in need of behavioral rehabilitation to make them adoptable. Won’t it create more expense than it is worth? No. Actually, it will SAVE us money while increasing the number of dogs we are able to rehabilitate. Currently, in order to save dogs in need of behavioral rehabilitation, we have to place these dogs in privately owned training facilities. These for profit facilities owned by local trainers have done an AMAZING job at helping us save the lives of dogs we would not have been able to help otherwise – but, they come with a hefty price tag – an average cost of $2500 PER DOG. Using the funds we spend monthly helping these dogs, we could provide training and rehabilitation to far more dogs using our own facility than we can currently. The facility will also provide stability to the rescue and the dogs we are responsible for, something that is desperately needed. With a foster network and no physical location – what happens to the dog if the volunteer foster home quits? Or if a dog that was adopted last year suddenly and unexpectedly needs to return? For almost every foster based rescue, including ours, these dogs wind up in boarding while we scramble to find somewhere for them to go. This is not only less than ideal for the dog, but it creates enough stress on the rescues that the burnout rate is very high – with so many new rescues not surviving their first year. It is so imperative that our rescue organization have a home – a place where the dogs are ALWAYS welcome. Lastly, this facility will provide community support that is also lacking in Central Florida. Most owners who start to experience behavioral issues with their own dogs at home, do not really feel like they have anywhere to turn. Just choosing a trainer is challenging for someone with no experience – since training is not a licensed profession, and so many trainers may be excellent at teaching a dog to sit and heel but have no practical experience with more serious behavioral issues – it can be difficult for a dog owner to find a trainer that can actually help with the issues they struggle with. When they do find a great trainer – it also comes at a large cost – which many pet owners struggle to afford. The new rescue facility would provide low-cost training services – and FREE training and education workshops – to pet owners in Central Florida. We hope these services will have an impact in reducing the number of dogs that arrive in local shelters due to behavioral concerns, and help educate owners on the importance training and socialization. We hope to be able to open our new facility in early 2018! We have currently raised over $30,000 of the start-up capital needed. 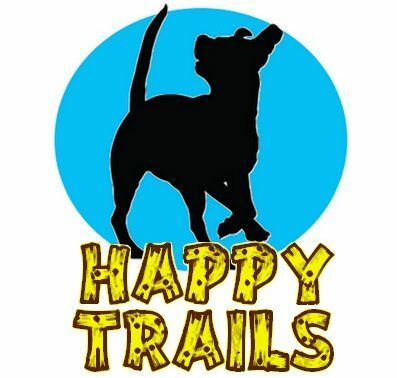 If you are able to make a contribution, large or small, towards this milestone in Central Florida rescue – please visit our website http://www.HappyTrailsAnimalRescue.com and view the donate tab for more information on ways to contribute. Or click Contact Us if you are interested in making a large contribution or sponsorship to our facility – we would love to discuss ways you could commemorate your contribution with a plaque or dedication at our new location!